You might ask what history and romance have in common. 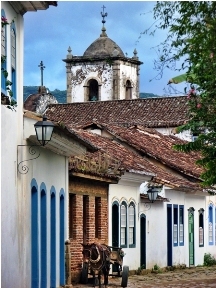 Paraty, Brazil has both, and you’ll quickly realize it when you walk on stone-paved roads from the last century, through the midst of the town’s oldest buildings. This inviting and lovely town is situated 250 km (180 miles) away from the city of Rio de Janeiro, Brazil, and was founded in the turn of the 17th century by Portuguese navigators enchanted by the natural beauties of the wonderful bay city. Slowly, this settlement grew until it became a very important “villa” in the beginning of the 19th century when its port was used to ship gold to Portugal and, later, to transport coffee beans to Europe. 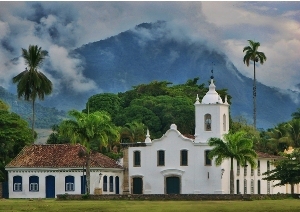 At its peak, Paraty had 16,000 inhabitants and was the second most important port in Brazil. Gradually, it lost its appeal down to the point where only 600 people were living there. For almost 100 years, it remained forgotten and stopped in time until a decision was taken to “freeze” the town as it then was and transform it into a tourist area called the “Historic Center.” Only renovations of the existing buildings were allowed and any new buildings were to be built outside the center. Because cars cannot be driven within the closed perimeter (it would be almost impossible, as the alleys are narrow and motor vehicles would destroy the stone-cobbled pavement), only donkey carts and bicycles are allowed to transport goods and people. Today, the colorful houses offer restaurants with delicious food, arts and crafts stores and clothing. Local music permeates this romantic atmosphere as you stroll along on the ancient stones. A must see and taste is the popular and renowned “cachaça” (liquor made from sugar cane) with its different varieties, colors and flavors. It’s best to resist cachaça in its pure — and strong — form, but don’t miss the “caipirinha,” a refreshing mixture of cachaça, mashed lime, a bit of sugar and ice that you can have before the meal at a restaurant or even with a group of friends that share the same glass. If you like special events, choose May for the Feast of the Divine, a religious feast that literally shakes the whole population, which crams into the small church for the ceremonies. Or choose June, when Flip, a literary festival, doubles the population of the city. Outside the Historic Center, a small, narrow harbor holds dozens of boats that provide remarkable trips around the many islands of the bay through the blue and green waters. On one of the small islands you’ll find an even smaller restaurant offering delicious and very fresh seafood (most of the time caught right there) in a romantic and quiet oceanfront setting. 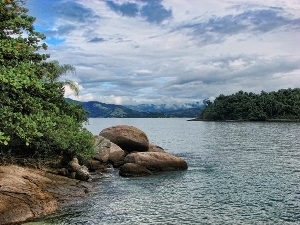 Finally, if none of the above really gets your attention, just drive around a few kilometers from Paraty and you’ll see gorgeous and calm beaches and, in the surrounding forests, relaxing waterfalls. The boat trip is a must but make sure to negotiate the ride price with the owner and pilot of the boat and have a 5-hour ride for as little as US$45 apiece. Hotels and hostels are not located in the city center and their prices vary depending on the season and quality of the service but you can get a very clean bed and breakfast with air conditioning from US$40.